That's right folks, it's another Miniature Monthly post. I'm not much of a one for painting figures as display pieces but Miniature Monthly recently started a paint along series for this new figure - Tank. Tank is an expansion character from Wander: The Cult of Barnacle Bay. I didn't pick up the game although reviews of it seem pretty positive. 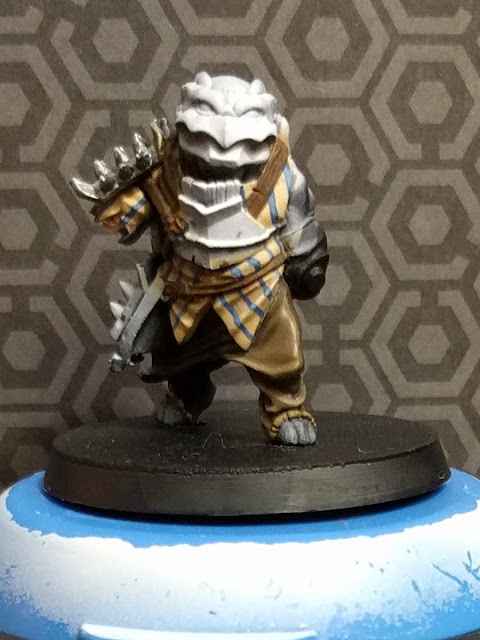 I hope to get tot try out the game at some point but in the meantime this figure has given me the opportunity to really push my techniques in new directions. freehanding stripes, texturing fabric, leather and further working on NonMetallicMetal effects with weathering. I got a little distracted before even starting on the model as a friend lent me some ScaleColour paints - something I'd heard great things about and been wanting to try for a while. A shoulder pad got some True Metallic Metal treatment. The job was a little rushed but the results were astonishing - these are far and away the highest quality paints I've ever encountered. After that slight detour, it was time to get some paint on the pants. I was working off of memory for this section, not consulting the Miniature Monthly video as I went which resulted in the pants being a much darker colour. Miniature Monthly had stripes painted onto the pants, with the darker base colour, I decided it wouldn't work very well and so opted to have a stripped shirt instead and maybe return to the pants to add in some texturing. I focused on a much lighter linen colour for the shirt so the stripes of blue would stand out a little better. Shading the shirt was interesting. It is hard to really see in photos but the colours for different parts of the shirt are actually pretty different as I played with the light and shadow. This is my first ever attempt at stripes. 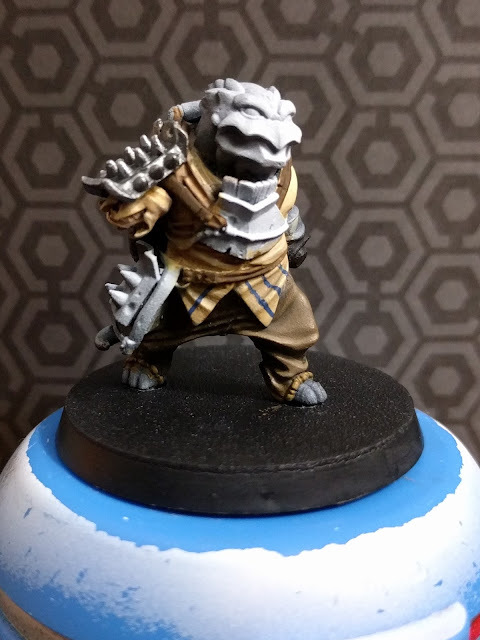 I have done plenty of freehand work in my time (numbering Blood Bowl bases is great for this) but stripy clothes definitely seemed like a step above what I'd done previously. 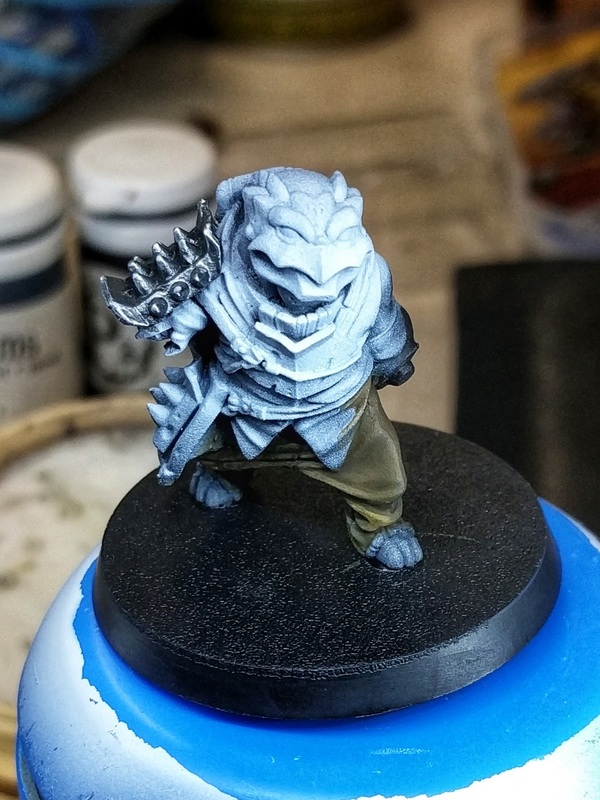 There were a bunch of amazing tips on the video for doing this, the one I am going to share is when highlighting from the base coat - paint from the middle to the edge but don't paint the edge. I love this for a couple of reasons - it makes screwups less likely for one but it also keeps those lines looking really nice and sharp. In my next post, I'll be working on texturing the pants, the NMM and texturing the leather.